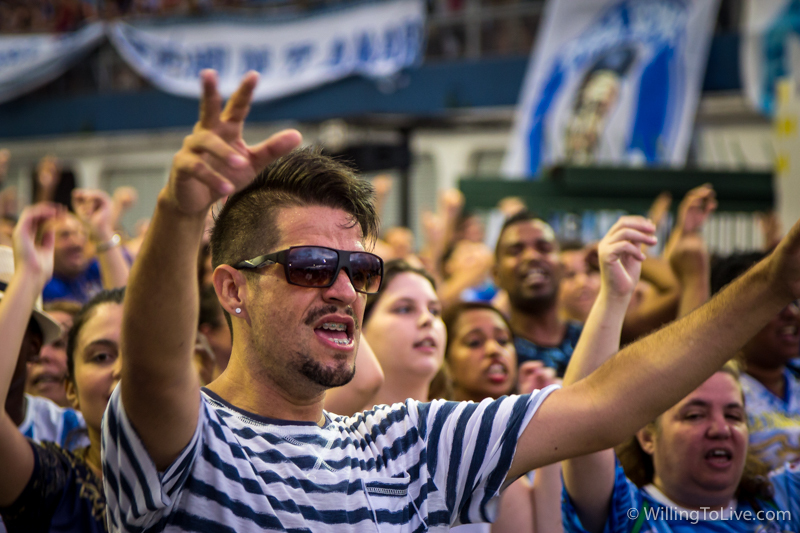 Filipe, do you enjoy the samba schools’ parade? To be honest with you, not that much. But, what if we went to Sambadrome to photograph the parade rehearsal? Hum! Is it possible? Of course, it is! Wow! Now you are speaking my language hahaha. It seems to be a very interesting experience. I’ve never seen a parade nor its rehearsal happening live in front of me, just on TV. I think it will be really nice to see how it is and do it in the way I like the most, photographing it. Let’s do this! It doesn’t just seem to be cool, it was awesome. Be able to be there with a lot of happy people doing something they love and also with the music, especially the drums section, is something contagious. Just happiness and fun. A great opportunity to know a little more about our own culture, relax and recharge our energy photographing a lot there :). Just follow the steps below to have a nice photowalk in sambadrome during samba schools’ parade rehearsal in São Paulo. If you have an authorization, the best spot is yours whenever you want. 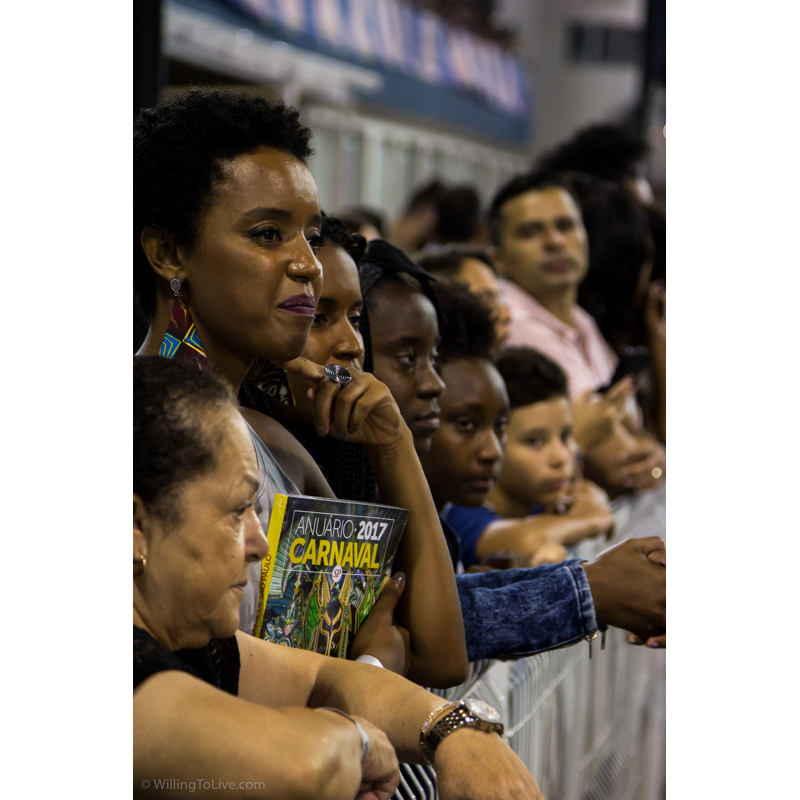 So, you can try grandstands before it gets crowded (your first spot) and then, using your authorization, go along with the samba school when you want to and also visit dispersal and concentration areas. Come back here and tell us in the comments about your experience there and what you may have learned. You certainly can do a lot of great images there. Knowing where to stay and why to photograph from those places will help you chose your gear and have more fun there. More about that below. I will start with some general comments. First of all, the day I went there, the first samba school started at 18h and I left there at 23h. So, there is no need to spend the whole night and early morning there to be able to see the rehearsals and enjoy them. But if you like to stay awake during night time, do it and stay there as much as you can :). Another important thing, you don’t need to buy a ticket for parade rehearsals, they are free! You can also walk through the whole Sambadrome (except parade avenue), no need to stay in just one spot. When you get there, there is an inspection. But they were just loosely inspecting bags. There was no problem to get there with camera gear and a bottle of water. But for alcoholic beverages, they won’t let you in. Biggest schools go to the rehearsal with more people using costumes. But none of the schools bring their floats. It is just the rehearsal, not the big show time. But even being the rehearsal it was awesome. One thing that caught my attention is that when you point your camera you get a pose hahaha. Seriously! A lot of them pose to you when they notice you are photographing them, you don’t even need to ask. Girls, men, children… it doesn’t matter. That is when a big camera is good hahaha! With a smartphone, they probably won’t notice you, but with a DSLR they like and will show their performance, costumes and so on. Take with you plenty of memory cards. You will probably get excited and shoot a lot. 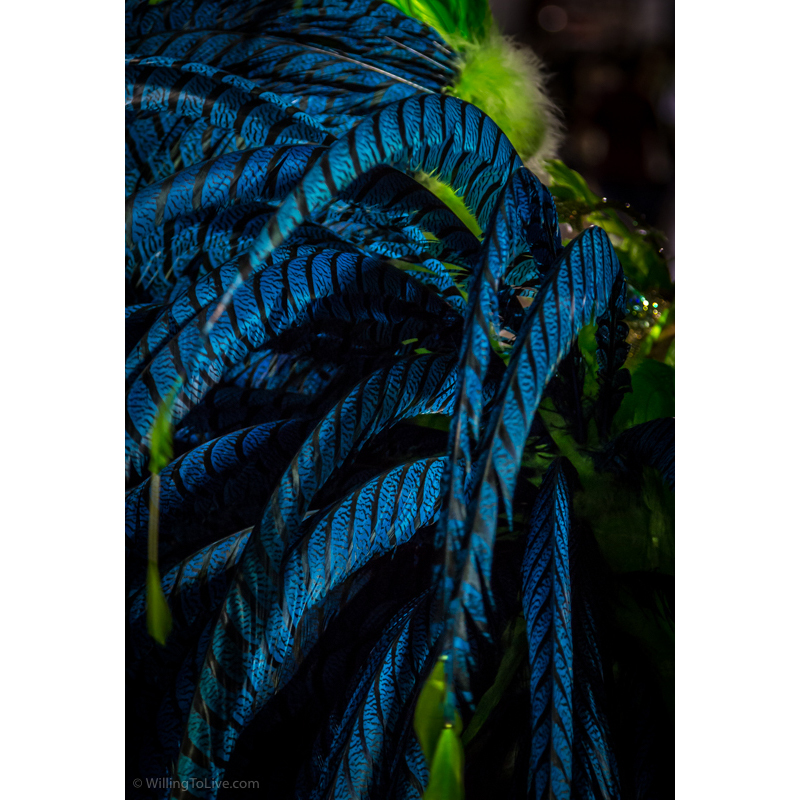 I’ve made about 930 clicks (average of 300 clicks per samba school). One of our friends had her memory card full. Hopefully, it was at the end. However, if you are an experienced photographer, you probably won’t need to worry about this. It was really different from what I am used to photographing. Events, portraits, and moving subjects are not in my day by day photography. But it was really awesome, I loved the experience. I like to photograph different stuff. It is always a challenge and an opportunity to learn and grow. As you may guess, people are dancing, so they move a lot. When you combine this with night time, you are probably thinking that there is not enough light to freeze motion, right? Well… kind of. I will give you more information about this below. But you can try to take the lack of lighting to your advantage and capture the movement of people performing with longer exposures. Besides shutter speed issues to freeze motion in low light conditions, the focus tracking system also needs to work well. Some of them walk in straight line and not very fast, sometimes even stop, but some of them walk and run to all directions. It is tricky to get them when you are very close to them. Another thing that caught my attention was the difference from natural lighting (when we arrived, there was still natural light) and artificial lighting. I thought it was just a small difference, but there is a big difference. Colors get more vivid and call more attention, and I’m not talking just about the final photos, I talking about what you see when you are there. Now, I will give you more details about the main spots you can stay during the parade. Each of them has a different point of view of the show. 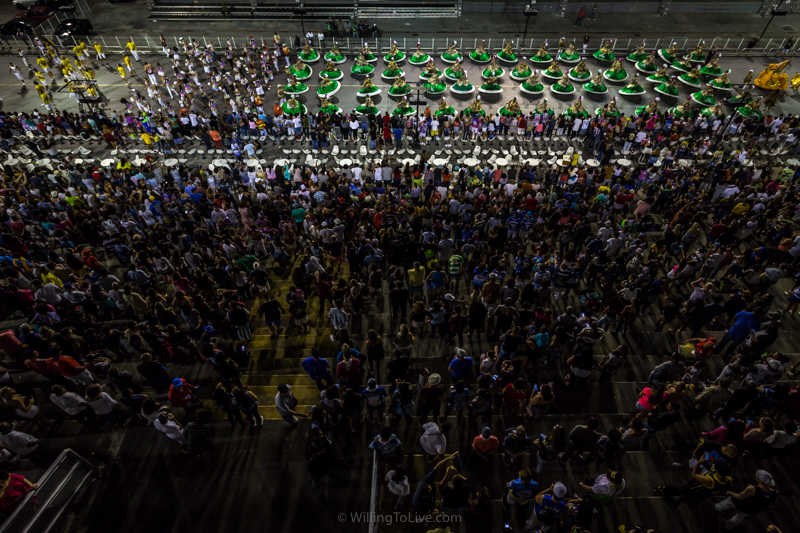 This is where samba schools wait for their turn to start the parade in Sambadrome. 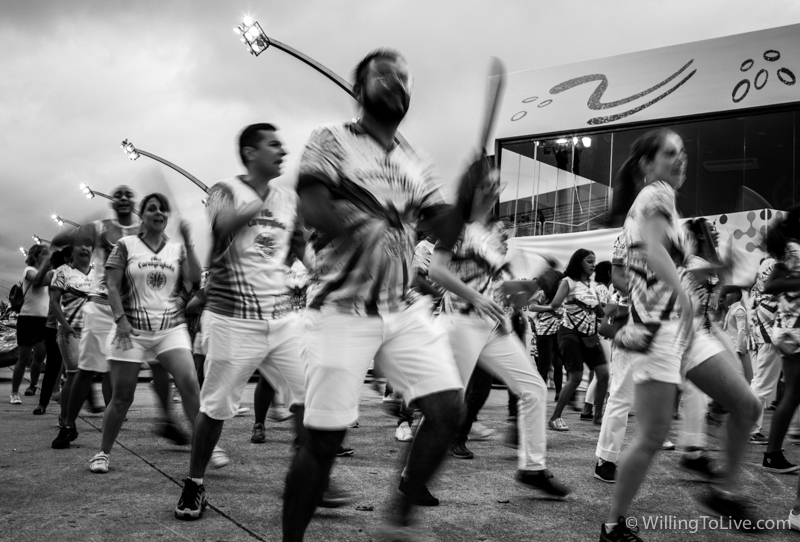 There, you will find people preparing themselves, listening to the instructions from their samba school, starting to get excited about the parade, and some will be already dancing. There is also that feeling of anxiety, for sure. You can get as close as possible to them, so you will have more intimacy. It is a great place to get the emotion of the revelers. Lighting is poor. If you don’t have a flash or a fast lens plus a camera with low noise for high ISO, your best time there will be with the first school, when there is still natural light (what we did). Note that some of the rehearsal days won’t start early enough for you to get natural light. Check the schedule of the day you want to photowalk. 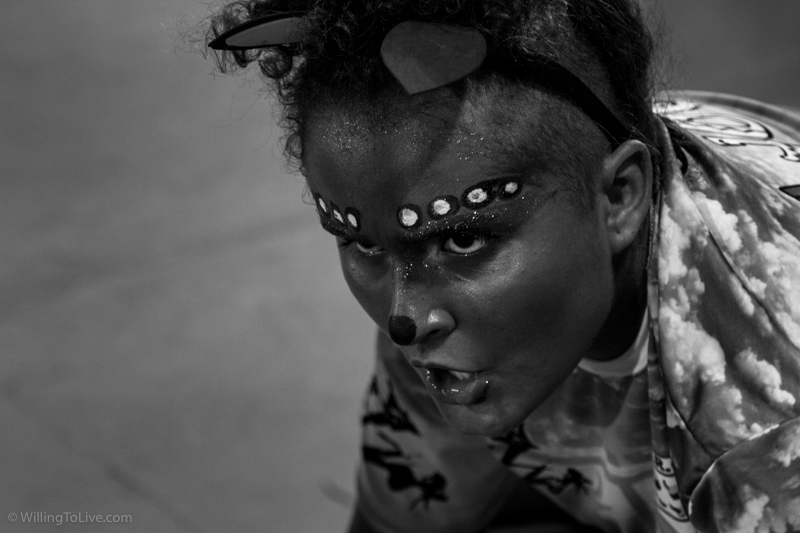 You can do this on the website of the samba schools’ league. 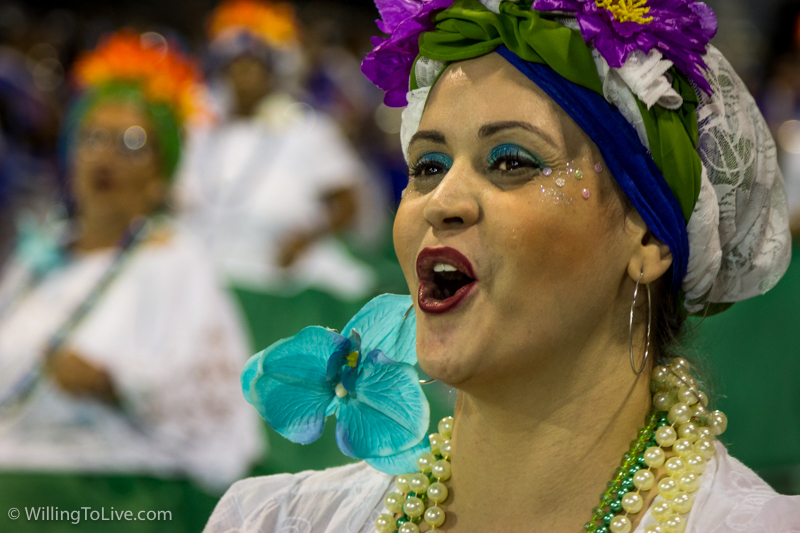 Another thing to have in mind is that the concentration area may get very crowded, especially for bigger samba schools. So, it may be difficult to get close to the revelers. They are very similar. 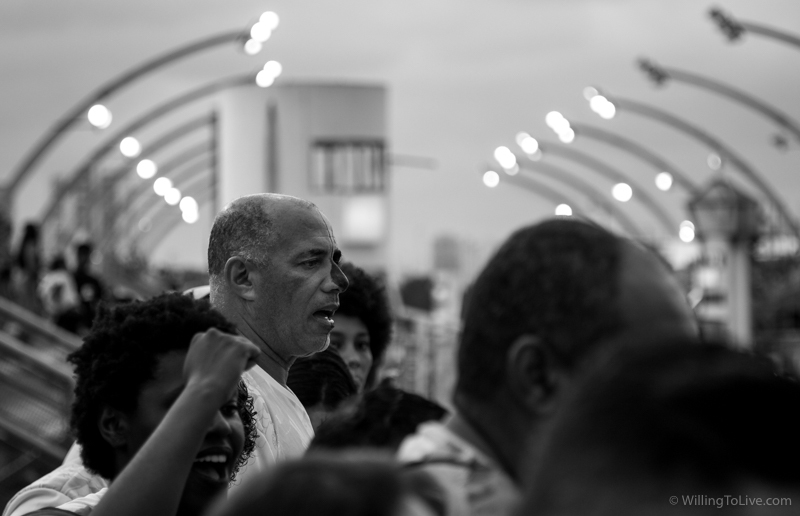 The later, you have the freedom to walk with the samba school, stop, walk faster to photograph the same people again and so on. I think you got the idea, you are free to move. 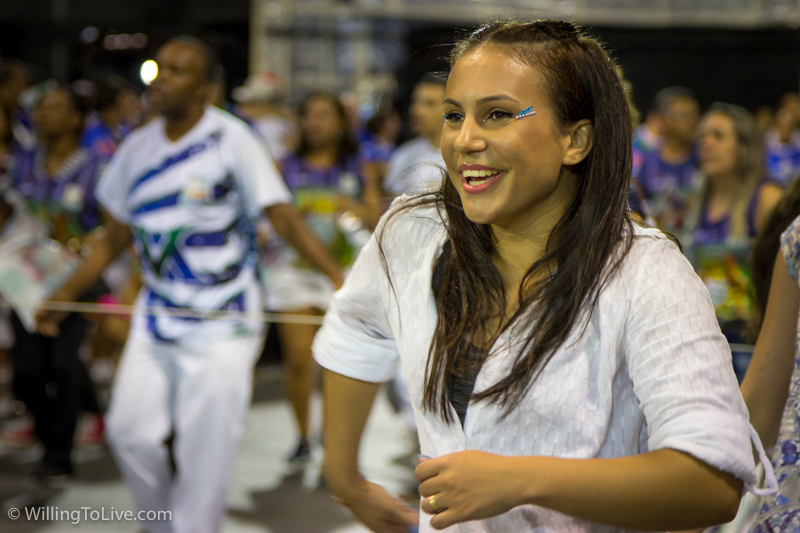 But not completely free, you can’t cross the avenue when a samba school is doing its parade. So, choose your side and have fun. There will be more people walking with you at the side of the parade avenue, sometimes you will need to stop to photograph so they can pass. You will also be just in front of the ones that are next to the lateral fences, so they may get annoyed, hehehe. It will be nice of you if you keep walking a bit. A very important thing, you need an authorization to be able to get to this place. So check their website to know when it will be the time frame that you can ask for an authorization, usually, it happens sometime during the second semester of the year before. You can also try to talk to the press office there, maybe you are in a lucky day and they let you in. What happens if you don’t get it? You will need to find a spot at the fence :). So, if you want to photograph from the lateral fences you will need to find your spot and you will need to stay there. Why? Because if you leave, you won’t be able to get it again, it is crowded there. Get to Sambadrome early (a little bit earlier than the first school parade seems to be safe) and get your spot. We couldn’t find a spot anymore next to the fence after the first samba school finished their parade. I was with a f/4 lens with a cropped sensor camera. 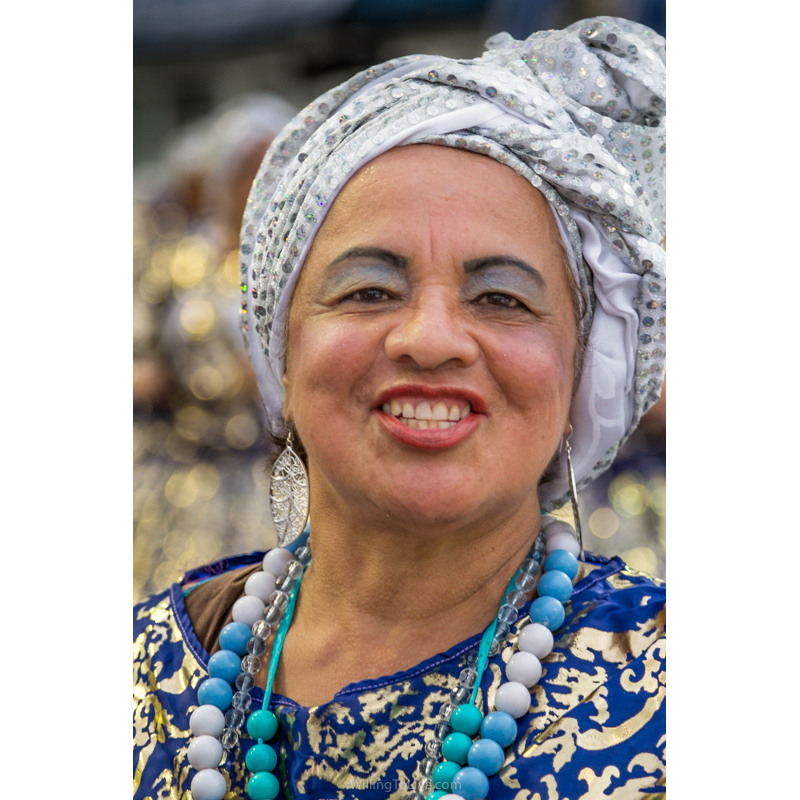 When you are at this spot, you are very close to the revelers, they move fast while dancing. If you want to freeze movement, you will need higher shutter speeds. I was trying to use 1/200 and it was not enough to freeze motion in some situations. Filipe, did you remember to increase ISO? Yes, I did. It was at 1600, the maximum acceptable for my camera and my personal tolerance for noise. Actually, usually, my personal maximum is 800, but for critical situations, I use 1600. So, f/4, 1/200 and ISO 1600 was the limit to get most of the photos correctly exposed. Less light than this resulted in underexposed photographs. If you have a faster lens, it will be better for you. Better because you will have more light (able to use higher shutter speed) and also because you will get better subject isolation from an unpleasant background. Sometimes your background will be other revelers, but sometimes they will be fences, grandstands, and other useless stuff. I don’t like noisy backgrounds. I want the attention to the main subject of the image, nothing else. The background, if relevant, needs to enhance the context of the scene, not to distract who is looking at your photograph. So, subject isolation with out of focus background is good :), bokehlicious :P. But don’t forget that your depth of field will be shallower and focus can also be tricky in this situation. So, is there enough light for you? I don’t know. I don’t know what gear you have :). But I think I gave you the information you need to think by yourself. If not, just ask in the comments below. 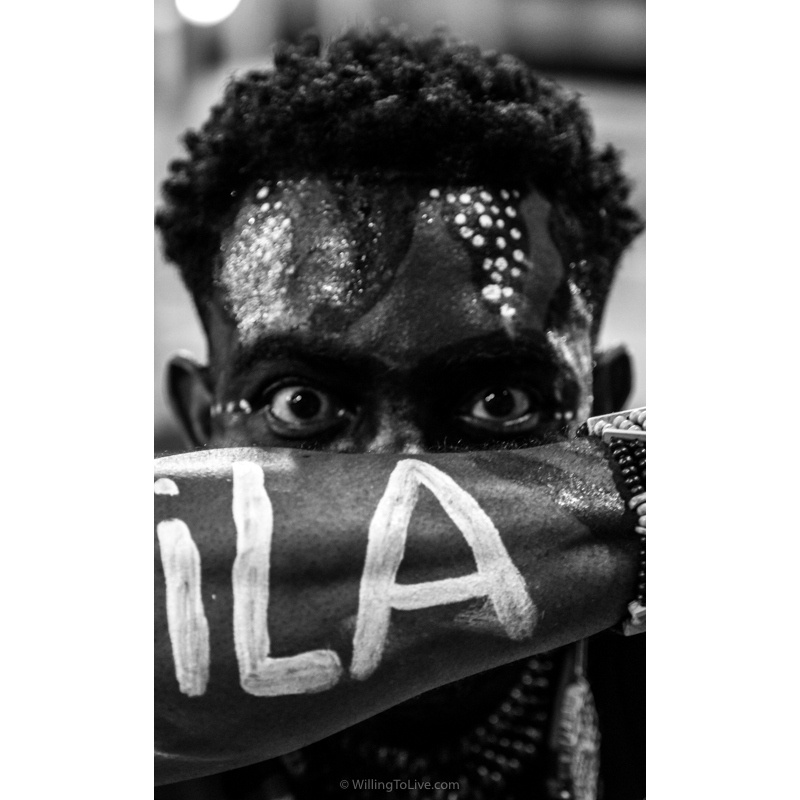 In worst case scenario, you can photograph revelers that don’t move that much or wait for the short moments that the ones that move fast are moving slowly. There will be a lot to photograph, don’t worry, shoot happy haha :). There are two kinds of grandstands there, the regular ones and the highest one. There are several regular ones throughout the parade avenue, but there is just one really high. From the regular ones, you can get a nice point of view, a “little” above the ground. 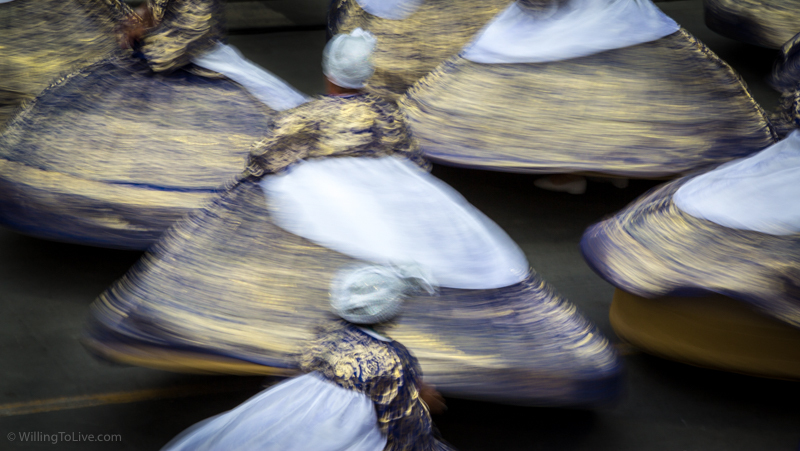 It is an interesting opportunity to photograph the movement of the group using a little longer shutter speed, especially from the “ala das baianas”. You can get them even without tripods if you use the fence to stabilize your arms. It is also a nice spot to get the view of the Sambadrome, the parade avenue, and from the people that are watching the parade. I was using a 24-105mm lens on a cropped sensor (38-168mm full frame equivalent). It was not possible to take a portrait of just one person filling the frame. I needed to crop the image in post-production to remove unnecessary surroundings (I think you remember that I don’t like noisy backgrounds, right? :)). So, you have an idea of what to expect from the lens focal distance when you are next to the fence of a regular grandstand. And the higher grandstand, Filipe? Well, it is high haha :P. To get there, you need to go to the regular grandstand below it and, in the middle of it, there will be an entrance to the higher one. It is far from the parade avenue, so this is the place to take photos of the revelers together with the crowd. You can also take photos of many revelers together from this spot. It is also possible to see the drums section’s retreat, but is a little bit far to get really close photographs of it, just group photos. This is where the parade ends. People are very happy, relieved for the great parade they just have made. A lot of emotions going on there, actually… We saw a female flag holder fainting just after ending their parade, and another one crying with his partner. I think you got the idea, it is the best place to get the emotion of the revelers and sometimes the excess of them. In this spot, you can also get as close as possible to the revelers, and also in the middle of them, not just at the side like in concentration and during the parade avenue. A perfectly normal thing, but it may be an interesting detail in your photography. After the parade, most of them are sweaty. And yes, they still have energy to pose for you :) See below. From dispersal, you can get a photo of the samba school as you were in the middle of the parade avenue. You just have to get there before they end their parade. So when they are about to end you position yourself in the middle of the dispersal and take the shoot. 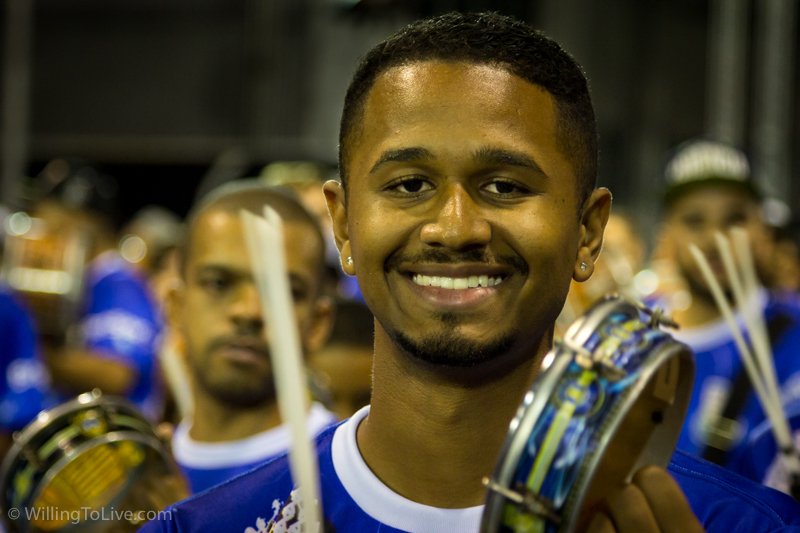 For our first samba school, as it was not that big, we get some photos from them in the concentration area. Then we saw they entering the parade avenue from the grandstand and then we walked to the dispersion to get them arriving there. Remember, this just works for smaller schools. Bigger schools have too many people, you won’t be able to watch the whole school from the grandstand before going to dispersion if you want to get them arriving there. Like the concentration area, lighting in dispersal is worse than in the parade avenue. It will make your life much easier if you have a fast lens and a camera that works well using high ISO. In general, people don’t move that fast, so your shutter speed can be lower. This will be useful for you due to the lack of light. You can get there by car, there are some parking lots there. But usually, they are crowded and also not cheap. Parking on the streets is not easy, I would say it is not possible/advisable. If you want to go by car, get there early to at least don’t lose time waiting to park. In my opinion, the best way to get there is by subway. There is a subway station near there, Portuguesa-Tietê. This station is in front of the biggest bus terminal of São Paulo. But from the subway to Sambadrome, it is not a good idea to go walking, it is dangerous. So, you can get a local van that does this route (usually crowded and cost R$4,00) or a taxi/uber. As we were in a group of four, we got a taxi. To come back to the subway station after the photowalk, you can do the same, taxi or van. To get in the Sambadrome, look for the entrance of the concentration area. Wow, this photowalk was an incredible way to relax doing something that I love. 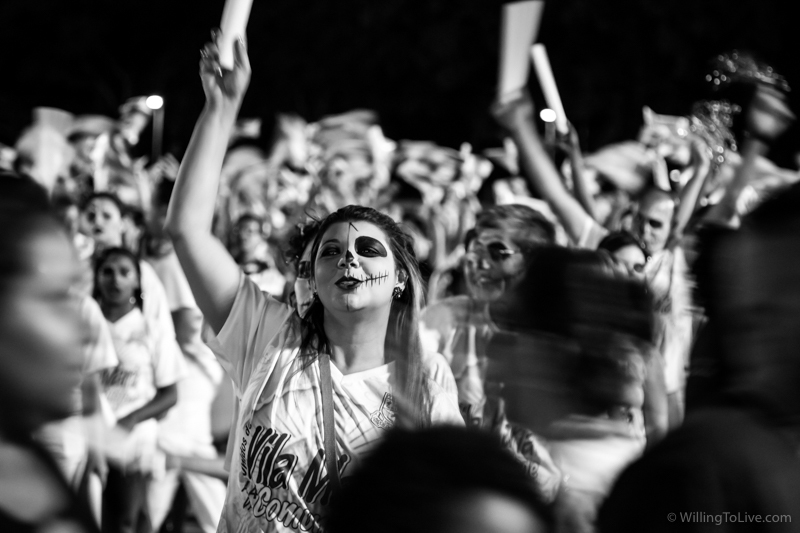 The happiness of the revelers and the whole atmosphere that is created is very contagious. You just enjoy your time there and forget about anything else. It cheered us up and gave us new energy to continue our lives. I also can say that now I appreciate carnival parades more. It is interesting how this kind of thing happen, but when we live an experience and learn more about something, we tend to like it more and have more interest in them. Even when it is just a little bit, like the day of this photowalk. The same thing happened when I went to Peru and learned about the Incas and all the things they have done. Now anything related to Inca culture and Peru draws my attention much more than before. I’ve missed the focus of many of my photos during this photowalk. Photograph moving subjects in not great lighting conditions is a challenge. But, in the end, having a good time like I had that day and also to photograph something that for me was new makes all the difference. I photograph to enjoy my life, not just to have good memories or photos. It was a great experience anyway. More than that, the mistakes that I have made are useful to make me think about them and find ways to improve my photography. I would also like to say a big thank you to all the friends that went with me that day. It was really great to meet them there and also to learn with them how to photograph there. Thanks!! Do you want to see how they are awesome? We are posting the photograph we made that day in a public Facebook group. It is a good way to make our photographs reach the ones we have photographed. A lot of them see us taking photos of them, but don’t know where to find them later, so here they are: CARNAVALSP2018 – Ensaio Técnico 27/01. It is nice to help them have memories of that day :). I do at least one photowalk a month. I have many photowalks to tell you about.